New Hampshire has been by far my least adventured and photographed state in New England by a large margin and I was excited to finally get an official photo trip organized there for mid-October. 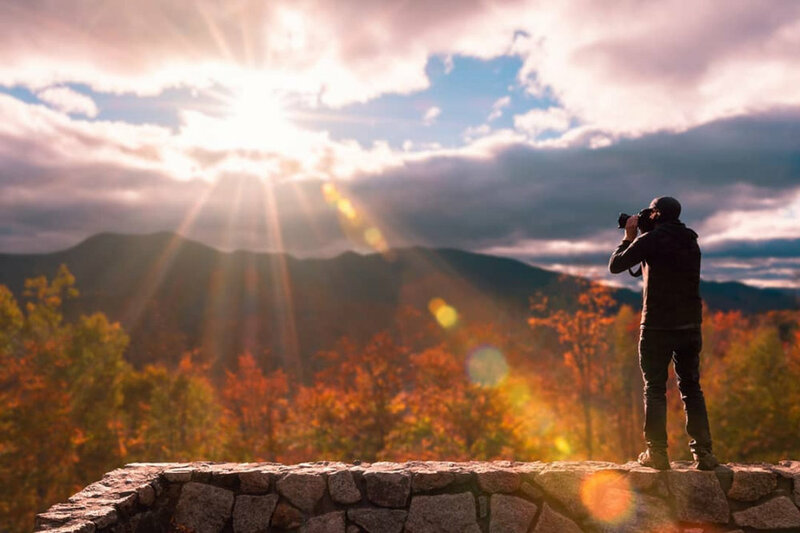 Back in July I started planning a long weekend up in the White Mountains with a group of photographer buddies from Connecticut that I’ve traveled with numerous times, including a long weekend up in Vermont this past February (go to Vermont adventure). Our first stop on the journey was 10 miles across the border in Wilton, New Hampshire to check out Garwin Falls. The short 1/4 mile trail down to the base of the main falls has a few spots where you can capture the scenic flowing river before getting to the main event. 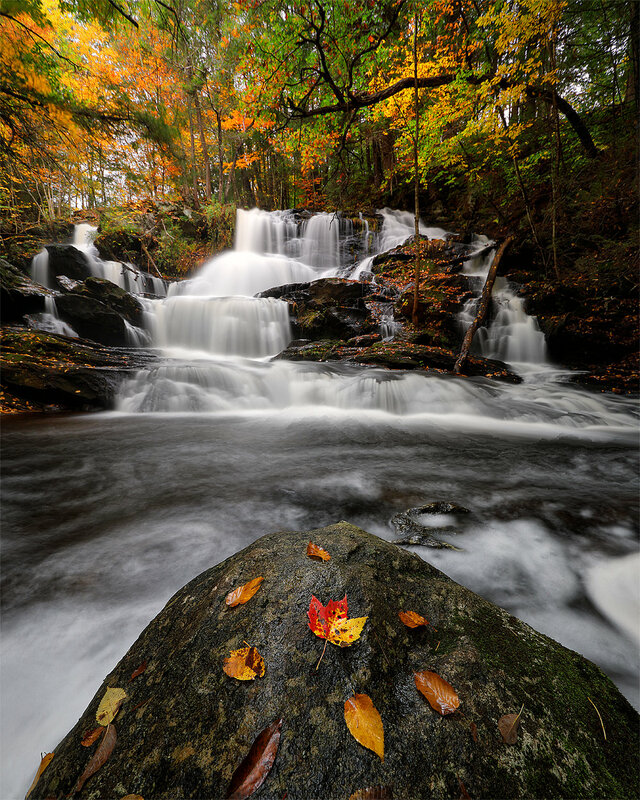 The main falls showcase an impressive 40 foot drop and multi tier cascades underneath a canvas of changing foliage. Was the perfect way to start off the photo adventure with the crew and set the tone for the awesome weekend of shooting. Getting up to the White Mountains area later in the afternoon we took our first drive down the famous Kancamangus Highway, a National Scenic Byway running 32 miles through the mountains from Lincoln to Conway. Was good to scout out the area and catch sunset from one of the roadside overlooks before heading to our cabin homebase for the night. Woke up the next morning to amazing views of the mountains in the distance from our cabin’s deck and I made breakfast for the crew, bacon egg & cheeses with home fried potatoes from scratch. With our bellies full we headed out to begin the day of shooting on Route 302 toward’s Hart’s Location and pulled over at this cool old train bridge over the Sawyer River. 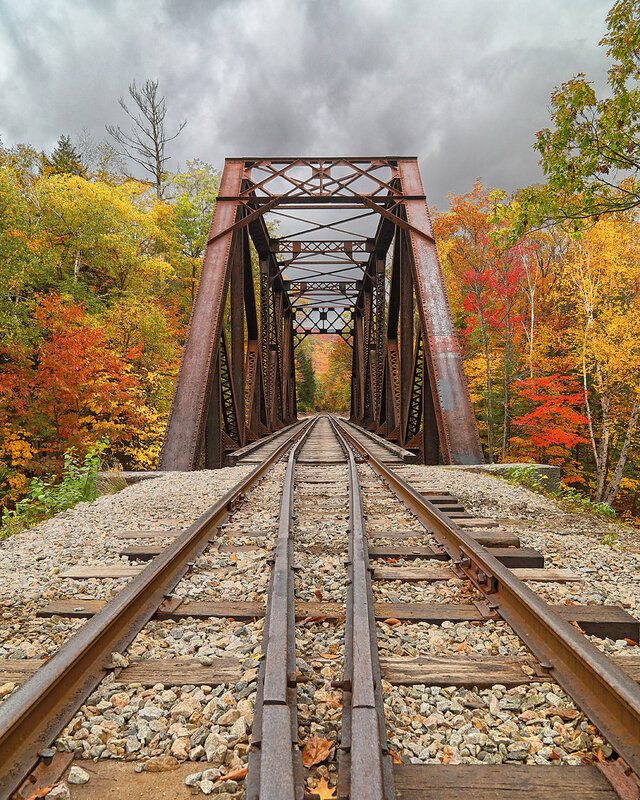 Enjoyed shooting at this spot and capturing the leading lines of the train tracks with the vivid fall foliage surrounding the bridge and providing a colorful backdrop in the distance. We then continued on into Crawford Notch State Park, stopping at several spots including Willey Pond & Willey House Historical Site. Was such an enjoyable ride through this scenic wonderland filled with bright colors every direction that you looked. We also made a stop on this road to shoot the famous Omni Mount Washington Resort, built from 1900-1902 with the help of 250 Italian artisans who were brought in to work on the granite & stucco masonry. A faint rainbow appeared next to the resort as we were there, only adding a bit more allure to the composition of this historic White Mountains landmark. We got over to Franconia in mid-afternoon and stopped at the old U.S. Route 3 bridge over Lafayette Brook that has been closed to traffic, but part of a multi-use bike trail now. Was a cool spot to adventure underneath by the river and also view Mt. Lafayette in the distance from up above. Our final destination for the day was Artist’s Bluff, a short but steep trail up to a surreal panoramic view of Franconia Notch State Park and Echo Lake below. Half of us decided to make a final push higher up to Bald Mountain overlook for sunset and were rewarded with another amazing view as the day’s last light was disappearing. That night after dinner 3 of us decided to brave the cold to attempt some night sky photography and it was well worth the frozen fingers. I came away with a great Milky Way shot with some fall foliage lit up nicely in the foreground to make for a very unique image. On our last morning of the trip we woke up early and layered up to head over to Bear Notch Road in Bartlett to capture the sunrise. Unfortunately the sky was too clear and didn’t make for any dramatic backdrops, it was still an amazing experience watching the colorful distant hills glow with the morning light. We had time for one more stop before heading back to the cabin to make breakfast and pack up before checking out, so we decided on Sabbaday Falls. One of the most popular falls in the area, a gravel pathway and wooden steps leads you to the edges of the falls that have a total drop of 45 feet. Cloudy conditions at the time were perfect for waterfall shooting and allowed for some great long exposures here. It was a great peaceful final spot for our weekend photo trip up into the White Mountains. I’m sure it won’t be my last time up to this area and I’m already trying to plan a winter adventure up there!